The Museum is housed within the old Stamford Town Hall built in 1874. The Lundy's Lane Historical Society was given the building in 1971, becoming the Lundy's Lane Historical Museum. On January 1st, 2010, the City of Niagara Falls took direct operation of the museum and it became Niagara Falls History Museum. Housing a vast collection of Niagara Falls history, the Museum provides a showcase for the unique past of the famous city. 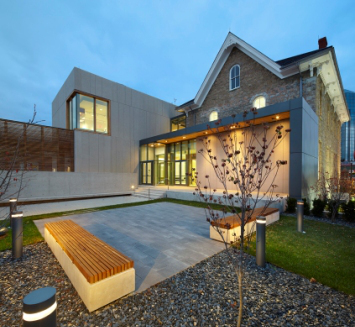 The Museum's recent $12M renovation and expansion creates a dynamic spaceto examine and explore our diverse history. It re-opened to the public on July 21, 2012. 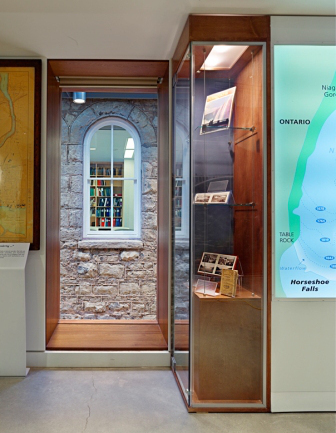 The renovation and expansion was designed by Toronto architecture firm Moriyama and Teshima, and now features three remarkable galleries telling the most compelling Niagara Falls stories with engaging hands-on exhibitions. The Museum is located within steps of the Drummond Hill Cemetery, the focal point of the Battle of Lundy's Lane, considered the "bloodiest battle" of the War of 1812. The starting point for any trip to this battlefield will be a visit to the Museum. 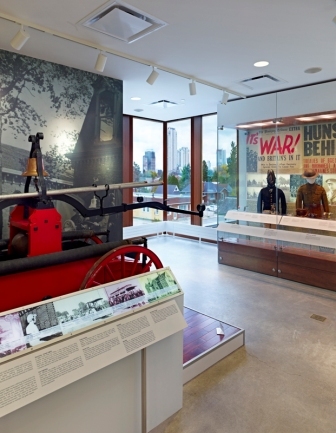 This gallery interprets the War of 1812 with a primary focus on the Battle of Lundy's Lane and houses one of Canada's best 1812 collections. This space is designed with audio-visual ambiance of war and hands-on activities such trying on a military coatee, handling a musket and feeling the weight of a cannon ball. The collection includes uniforms, weaponry, equipment, relics, buttons and archival records relating specifically to the Battle of Lundy's Lane and to the War of 1812. The community gallery provides visitors with the opportunity to learn more about various aspects of Niagara Falls as a community. The people, the culture, geology, social life, industry and dare devils who attempted to conquer the falls are among the highlighted topics in this gallery. We have a geology interactive which at the touch of buttons illuminates rocks extracted from different parts of the falls. A bridge building interactive allows visitors the opportunity to build bridges across the falls. And for the brave at heart, we have a ‘tight-rope walk' going across the falls. Our temporary gallery houses travelling exhibitions from other museums on a short-term basis, providing us with the opportunity of hosting 3 to 4 different exhibits every year. Our visitors are exposed to exhibits which otherwise may not have been easily accessible, and our regular or repeat visitors have something new to see on each visit. Past exhibitions in this gallery include: “Electricity” from the Ben Franklin Institute, Philadelphia, USA; “Art-of-Fact” from the Niagara Artists Centre, St. Catharines, Ontario; the award winning "Motels: Honeymoon Suite or By-the-Week, Motel Culture in Niagara"; “Fakes and Forgeries” from the Royal Ontario Museum, Toronto, Ontario and “Ordinary Lives, Extraordinary Times: Italian Canadian Experiences During World War II” from Columbus Centre, Toronto, Ontario. Check out our current exhibitions. When our theatre is not booked for school groups, rentals or other functions, visitors can sit down and explore a wide variety of films that we curate based on themes in our galleries or on the history of Niagara Falls. Thursday 10:00 a.m. – 9:00 p.m. The museum is closed on New Years Day, Good Friday, Easter Sunday, Labour Day, Christmas Day, Boxing Day (December 26th) and December 29th. We will be closing at 4pm on December 24th and December 31st. Guided Tours: We offer guided tours to groups, which must be booked in advance. Accessibility: The Museum is easily accessible by wheelchair with a reserved wheelchair parking spot at the back of the Museum and ramps at both front and back entrances. For more on our accessiblity check out the report on our facility by Accessible Niagara. Washrooms: There is a family washroom on the main floor which is wheelchair accessible and more washrooms downstairs in the basement. Gift Shop: The Museum gift shop carries many souvenirs and gift items including books, jewelry, toys, candies, clothing and much more. We also offer 10% discount to all our members. Theatre/Multi-purpose room with modern audio-visual equipment, with a sitting capacity of up to 70 people and adaptable for different types of sitting arrangements. The Niagara Falls History Museum is located 15 minutes walk from famous landmark of Niagara Falls. When on Ferry Street, turn down Sylvia Place to access our large parking lot behind the Museum. The Museum is located on the WEGO Red Line and is close to the intersection of Main and Ferry and steps from the Battle of Lundy's Lane National Historic Site. Take the QEW towards Niagara Falls. Take the 420 when you get to Niagara Falls and exit at Stanley Ave. Turn right at Stanley and then right on Ferry Street. The Museum will be on your left just past Sylvia Place. After your visit to the Museum, don't forget to pick up the walking tour of the Lundy's Lane Battlefield, just minutes from the front doors of the Museum.